Some might find this blog interesting. I certainly enjoyed looking at all the brutalist architecture pics. The whole blog is pretty cool, full of pictures of buildings soon to be lost I fear. Yes, there is some great stuff there. I like an abandoned factory, or an empty street. I can't say these new-fangled antiseptic indoor malls are any better. I hate them. Always have. Rat mazes reeking of boredom and multi-levelled despair. An Italian piazza surrounded by military bunkers. A Dolcis. A Wimpy. Bollards. A big floating concrete shoebox. Some kids throwing caps. Scalding weak milky coffee under a striplight. Skateboard clatter. Tiny kids being dragged by the arm into the brutalist world they'll grow up to demolish with righteous joy. .
Yep I love all that, quite like browsing the Urban Exploration sites, my step son is into all that much to his mothers dismay! There are a few there I recognise, Hanley, Nantwich and M+S in Crewe which is now sadly a shop selling trainers and tat I think as they moved out a couple of years ago. Lovely building purpose built for M+S in the 30's I'd guess. Done Ashton a few times, been in the actual Bus Canteen to install a Pool Table. I've been to Swinton I think but not the town centre, if memory serves I had to pick up some stuff I left in a car that got written off and ended up in a breakers there. I've done Coventry to a few years back so recoginse the lay out and Liverpool of course. There are some interesting pictures in and around Manchester on the blog too which were quite interesting of old docks and ancient shop signs painted on walls. Where I live now used to be all black and white buildings but was revamped in the 70's in that grey concrete cladding that was the vogue and is now been all knocked down again except for the police station. They'e built a cinema and an Asda (not that we needed anymore supermarkets) a new multi storey car park and they have a shopping complex with around 30 units which have been empty for over a year which isn't surprising considering the rents + business rates + insurance etc. It's the biggest white elephant ever built! What they should have done is revamp the existing town centre instead of building a huge complex no one wants to move into. It's getting farcical now... Oh they also changed the whole road system into a one way ring road and made an already dangerous roundabout system into an even more complex one that no one seems to understand with a bookies that refused to move in the middle of it! A town or should I say city Preston seem to have got the right idea and residents seem to have taken over the council and are renovating the market area and car park to match the two Victorian market halls they have. I like Preston I think the town centre is fab and the market was great for records. I quite liked the add on indoor market and car park, reminded me of Slough car park which everyone seems to hate but I thought was a thing of beauty albeit it smelt of piss which is probably true of all multi storey car parks I dont know if theyv'e knocked it down, I did some work for O2 who have 4 big offices there but it was a few years back now. My childhood memories are of being in Warrington Times Square car park reading the graffiti and the smell of urine, walking across one of those glass bridges into an indoor market full of people selling bags and people eating chips squirting ketchup out of plastic tomatoes and hoping I could blag a wimpy or a Crusha milkshake for my forced shopping trip! That Swinton complex is a thing of true aesthetic beauty it looks like something straight out of ' A Clockwork Orange'. Did anyone watch the 'Matt Holness' short film 'A Gun for George'? He used old brutalist locations in that to great effect. I think around Margate, not sure, quite a famous complex but really brought it all to life and the addition of an Austin Allegro helped! 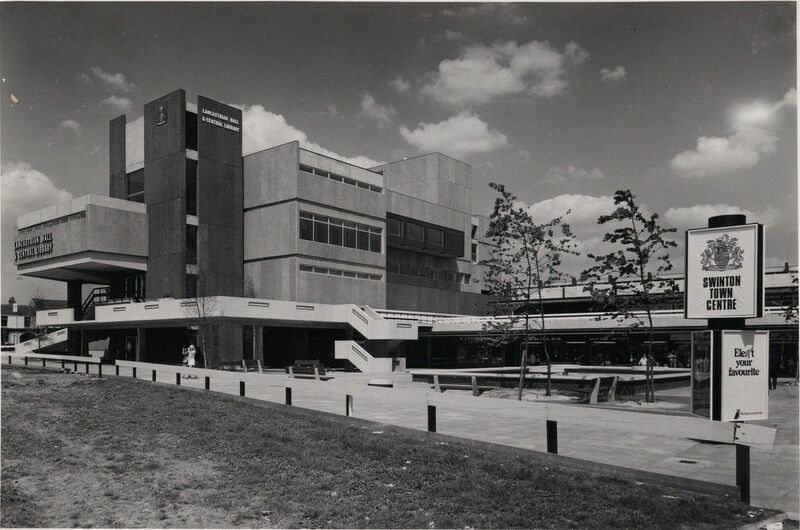 (There are many examples of brutalism I like: this was not one). There was one close by in Nottingham when I was there. It was like something out of a JG Ballard novel. Recent googling suggests that it no longer exists. Looks a bit like the underground car park in Rhyl. To be fair, a few of those shown in the blog don't look too bad. I see that the "Butts" in Reading appears. I had forgotten that. My guess is that they had casks of alcohol in mind when they named it. No - the name of the pub? I think it's a shame that the word 'precinct' might soon be lost, in this meaning at least. Are New York police stations still called precincts? 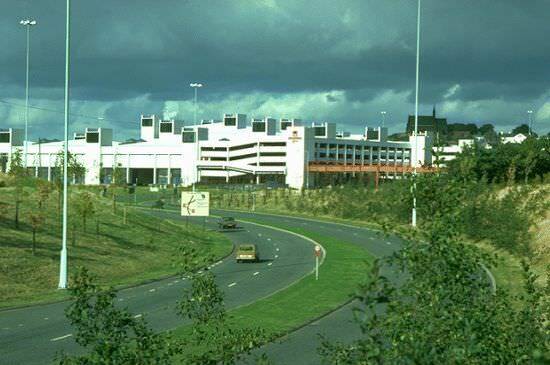 What looks like an old pic, possibly early eighties of 'Shopping City' in Halton which is part of Runcorn (which is a brutalist 'new town' in itself) with a crazy ring road system they've just spent lots of money rejigging for the 'Merseyflow' bridge. It was home to the last 'Wimpy' I knew until a few years back when it closed. The multi-storey car park does a car boot on a Sunday. Just brought to mind there are a few industrial parks around the expressway but one in particular used to be headquarters to IBM which is now split into lots of different businesses as IBM left at some point. You can sort of see the remains of it's space age look it would have had but I did some work at a server center there and one of the security was telling me about all the concrete tunnels it has running all underneath it. What for I cant remember.